Are your facilities’ standards up to par? We are hoping you’ve heard about standards and regulations in our fabulous cannabis industry. If you haven’t… um, well… time to make some BIG changes! 1. a rule or directive made and maintained by an authority. 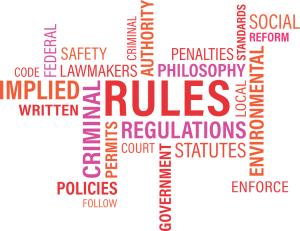 2. the action or process of regulating or being regulated. With such a flourishing industry, wouldn’t you want to work in a facility that held high standards and had systems in place designed to keep patients and customers safe? A facility that leads the way with compliance and regulations? Green Flower Media asked the question: Do you think international quality standards for cannabis are important? 94% of the people responded yes. With more and more states coming onboard with regulations for cannabis, it would make sense to have some universal standards. Let’s check out labeling for example. To ensure that people know a product, especially infused food, contains cannabis, Colorado created a “Universal Symbol”. The Colorado symbol is a red diamond shape with “THC!”. You’ll see this on labels/ packaging. You’ll also see it on edibles (thankfully- the red isn’t required for imprinting). Michigan just came out with their symbol that is an upside down green triangle with a green cross. California has a third and unique version as well. Standards for lab testing are imperative. Imagine someone being accustomed to a certain flower strain that provides the medicating benefits they require. If they were to travel to a new state, that strain may be very different and may have been grown with unfamiliar chemicals or pesticides. Jahan Marcu, the chief science officer for Americans for Safe Access, discussed the vast room for improvement with dispensary personnel training at an ASTM international standards conference in 2017. “Earlier this year (2017), ASA helped design a study which looked at training and education in dispensary staff workers,” Marcu said. “The study showed that about 80 percent of dispensary staff workers at medical cannabis dispensaries did not have training which included any medical or scientific information. As the industry continues to grow, how can you help raise that bar and strive for the highest standards? We are here to assist! We love our clients that are committed to excellence, professionalism and integrity. We look forward to working with YOU soon! Previous PostWhat joy will you bring today? Next PostHow do YOU dispel the cannabis stereotype? Choice Organics shares insights!